"MYT" redirects here. For other uses, see MYT (disambiguation). Mayotte (French: Mayotte, pronounced [majɔt]; Shimaore: Maore, IPA: [maˈore]; Malagasy: Mahori) is an overseas department and region of France officially named the Department of Mayotte (French: Département de Mayotte). It consists of a main island, Grande-Terre (or Maore), a smaller island, Petite-Terre (or Pamanzi), and several islets around these two. Mayotte is part of the Comoros archipelago, located in the northern Mozambique Channel in the Indian Ocean off the coast of Southeast Africa, between northwestern Madagascar and northeastern Mozambique. The department status of Mayotte is recent and the region remains, by a significant margin, the poorest in France. Mayotte is nevertheless much more prosperous than the other countries of the Mozambique Channel, making it a major destination for illegal immigration. Mayotte's area is 374 square kilometres (144 sq mi) and, with its 270,372 people according to January 2019 official estimates, is very densely populated at 723 per km2 (1,872 per sq mi). The biggest city and prefecture is Mamoudzou on Grande-Terre. However, the Dzaoudzi–Pamandzi International Airport is located on the neighbouring island of Petite-Terre. The territory is also known as Maore, the native name of its main island, especially by advocates of its inclusion in the Union of the Comoros. Although, as a department, Mayotte is now an integral part of France, the majority of the inhabitants do not speak French as a first language, but a majority of the people 14 years and older report in the census that they can speak French (with varying levels of fluency). The language of the majority is Shimaore, a Sabaki language closely related to the varieties in the neighbouring Comoros islands. The second most widely spoken native language is Kibushi, a Malagasy language, of which there are two varieties, Kibushi Kisakalava, most closely related to the Sakalava dialect of Malagasy, and Kibushi Kiantalaotra. Both have been influenced by Shimaore. The vast majority of the population is Muslim. The island was populated from neighbouring East Africa with later arrival of Arabs, who brought Islam. A sultanate was established in 1500. In the 19th century, Mayotte was conquered by Andriantsoly, former king of Iboina on Madagascar, and later by the neighbouring islands Mohéli and then Anjouan before being purchased by France in 1841. The people of Mayotte voted to remain politically a part of France in the 1974 referendum on the independence of the Comoros. Mayotte became an overseas department on 31 March 2011 and became an outermost region of the European Union on 1 January 2014, following a 2009 referendum with an overwhelming result in favour of the department status. The "rock" of Dzaoudzi and "Petite-Terre"
The term Mayotte (or Maore) may refer to all of the department's islands, of which the largest is known as Maore (French: Grande-Terre) and includes Maore's surrounding islands, most notably Pamanzi (French: Petite-Terre), or only to the largest island. The main island, Grande-Terre (or Maore), geologically the oldest of the Comoro Islands, is 39 kilometres (24 mi) long and 22 kilometres (14 mi) wide, and its highest point is Mount Benara, at 660 metres (2,165 ft) above sea level. Because of the volcanic rock, the soil is relatively rich in some areas. A coral reef encircling much of the island ensures protection for ships and a habitat for fish. Dzaoudzi was the capital of Mayotte (and earlier the capital of all the colonial Comoros) until 1977, when the capital relocated at Mamoudzou on the main island of Grande-Terre. It is situated on Petite-Terre (or Pamanzi), which at 10 square kilometres (4 sq mi) is the largest of several islets adjacent to Maore. The area of the lagoon behind the reef is approximately 1,500 square kilometres (580 sq mi),reaching a maximum depth of about 80m. It is described as "the largest barrier-reef-lagoon complex within the southwestern Indian Ocean" . Landscape of "padzas" over Passamaïnty. A "maki de Mayotte" lemur (Eulemur fulvus mayottensis). A Mayotte flying fox (Pteropus seychellensis comorensis). Mango trees around a river. Main article : Geology of Mayotte Mayotte is a primarily volcanic island rising steeply from the bed of the ocean to a height of 660 metres (2,170 ft) on Mont Bénara (Open Street Map gives this as 661 metres (2,169 ft)). The November 11 2018 seismic event occurred about 15 miles (24 km) off the coast of Mayotte. It was recorded by seismograms in many place including Kenya, Chile, New Zealand, Canada, and Hawaii located almost 11,000 miles (18,000 km) away. The seismic waves lasted for over 20 minutes but despite this, no one felt it. The exact nature of the forces behind this swarm remain unclear at this time. The French government geological agency, the BRGM are maintaining a website on the events at this link. The (current) leading theory is about magma emplacement into the seabed and a partial collase of the magma chamber's roof, but that is still under debate. A set of seabed seismic recorders was put into the ocean in February 2019, for retrieval in about September that year, which should give better earthquake locations and directional "solutions". Mayotte is surrounded by a typical tropical coral reef. It consists in a large outer barrier reef, enclosing one of the world's largest and deepest lagoons, followed by a fringing reef, interrupted by many mangroves. All Mayotte waters are ruled by a National marine Park, and many places are natural reserves. Choizil islands and their coral reef. Low tide over the coral at M'Bouzi island. Some very old Porites colonies. Green turtle (Chelonia mydas) at N'Gouja. Tsingoni's mosque is the oldest in activity in France. For the history of Mayotte before 1974, see History of the Comoros. In 1500, the Maore or Mawuti (contraction of the Arabic جزيرة الموت Jazīrat al-Mawt – meaning island of death and corrupted to Mayotte in French) sultanate was established on the island. In 1503, Mayotte was observed by Portuguese explorers, but not colonized. Mayotte was purchased by France in 1841. It was the only island in the archipelago that voted in referenda in 1974 and 1976 to retain its link with France and forgo independence (with 63.8% and 99.4% of votes respectively). The United Nations' constant policy regarding decolonisation has been that independence must be effected in the framework of the colonial borders and for that reason it has not recognized the validity of that referendum; over twenty UN resolutions have condemned France's annexation of Mayotte, while the independent Comoros have never ceased to claim the island. A draft 1976 United Nations Security Council resolution recognizing Comorian sovereignty over Mayotte, supported by 11 of the 15 members of the Council, was vetoed by France. It was the last time, as of 2011[update], that France cast a lone veto in the Council. The United Nations General Assembly adopted a series of resolutions on the issues, under the title "Question of the Comorian Island of Mayotte" up to 1995. Since 1995, the subject of Mayotte has not been discussed by the General Assembly. Mayotte became an overseas department of France in March 2011 in consequence of a 29 March 2009 referendum. The outcome was a 95.5 per cent vote in favour of changing the island's status from a French "overseas community" to become France's 101st département. Its non-official traditional Islamic law, applied in some aspects of the day-to-day life, will be gradually abolished and replaced by the uniform French civil code. Additionally, French social welfare and taxes apply in Mayotte, though some of each will be brought in gradually. Comoros continues to claim the island, while criticising the French military base there. At the time of writing (March 2019), there is a continuing series of minor earthquakes taking place to the east of the island, as reported in the Environment/ Geology section. The significance, insignificance, and consequences of this remain unclear at this time. The politics of Mayotte takes place in a framework of a parliamentary representative democratic French local government, whereby the President of the Departmental Council is the head of the local assembly, and of a multi-party system. Executive power is exercised by the French government. Mayotte also sends one deputy to the French National Assembly and two senators to the French Senate. Unlike the other overseas regions and departments of France, Mayotte possesses a single local assembly, officially called the "departmental council" (conseil départemental), which acts both as a regional and departmental council. The situation of Mayotte proved to be awkward for France: while the local population very largely did not want to be independent from France and join the Comoros, some post-colonial leftist governments voiced criticism of Mayotte's ongoing ties to France. Furthermore, the peculiar local administration of Mayotte, largely ruled by customary Muslim law, would be difficult to integrate into the legal structures of France, not to mention the costs of bringing the standards of living to levels close to those of Metropolitan France. For these reasons, the laws passed by the national parliament had to state specifically that they applied to Mayotte for them to be applicable on Mayotte. The status of Mayotte was changed in 2001 towards one very close to the status of the departments of France, with the particular designation of departmental collectivity. This change was approved by 73% of voters in a referendum. After the constitutional reform of 2003 it became an overseas collectivity while retaining the title "departmental collectivity" of Mayotte. Mayotte became an overseas department of France (département d'outre-mer, DOM) on 31 March 2011 following the result of the March 2009 Mahoran status referendum, which was overwhelmingly approved by around 95% of voters. Becoming an overseas department will mean it will adopt the same legal and social system as used in the rest of France. This will require abandoning some customary laws, adopting the standard French civil code, and reforming the judiciary, educational, social and fiscal systems, and will take place over a period of about 20 years. Despite its domestic constitutional evolution from the status of an overseas collectivity to that of an overseas department, effectively becoming a full constituent territory within the French Republic, with regards to the European Union, Mayotte remained an 'overseas country and territory' (OCT) in association with the Union (as per Article 355(2) TFEU) and not a constituent territory of the European Union in the same way as the other four overseas departments. However following a directive of the European Council in December 2013, Mayotte became an outermost region of the European Union on 1 January 2014. This successful agreement between the 27 member states follows a petition made by the French government for Mayotte to become an integral territory of the European Union nonetheless benefiting from the derogation clause applicable in existing outermost regions, namely Article 349 TFEU, as favoured in a June 2012 European Commission opinion on Mayotte's European constitutional status. Mayotte is divided into 17 communes. There are also 13 cantons (not shown here). There are no arrondissements. Ferry between Dzaoudzi and Mamoudzou. The official currency in Mayotte is the euro. In 2017, the GDP of Mayotte at market exchange rates was €2.9 billion (US $3.3 bn). In that same year the GDP per capita of Mayotte at market exchange rates, not at PPP, was €11,354 (US $12,820), which was 16 times larger than the GDP per capita of the Comoros that year, but only 49.5% of the GDP per capita of Réunion and 33% of the GDP per capita of Metropolitan France. Official population figures from past censuses. Last INSEE estimate in italic. On January 1, 2019, a record 270,372 people were living in Mayotte (official INSEE estimate). According to the 2017 census, 58.5% of the people living in Mayotte were born in Mayotte (down from 63.5% at the 2007 census), 5.6% were born in the rest of the French Republic (either metropolitan France or overseas France except Mayotte) (up from 4.8% in 2007), and 35.8% were immigrants born in foreign countries (up from 31.7% at the 2007 census, with the following countries of birth in 2007: 28.3% born in the Union of the Comoros, 2.6% in Madagascar, and the remaining 0.8% in other countries). Most of the inhabitants of the island are culturally Comorians. The Comorians are a blend of settlers from many areas: Iranian traders, mainland Africans, Arabs and Malagasy. Comorian communities can also be found in other parts of the Comoros chain as well as in Madagascar. Due to large inflows of immigrants from the Union of the Comoros, the native Mahorans have now become a minority on the island among the adult population. At the 2017 census, the people born in Mayotte made up only 39.9% of the adult population, while the people born in foreign countries (predominantly the Union of the Comoros) made up 54.6% of the adult population. In 2017, the mothers born in foreign countries (predominantly the Union of the Comoros) were responsible for 75.7% of the births that took place in Mayotte. The main religion in Mayotte is Islam, with 97% of the population Muslim and 3% Christian. The main religious minority, Roman Catholicism, has no proper diocese but is served, together with the Comoros, by a missionary jurisdiction, the Apostolic Vicariate of Comoros Archipelago. Kibushi is spoken in the south and north-west of Mayotte, while Shimaore is spoken elsewhere. various non-Shimaore dialects of the Comorian language, essentially imported by immigrants who have arrived in Mayotte since 1974: Shindzwani (the dialect of Anjouan, or Nzwani), Shingazidja (the dialect of Grande Comore, or Ngazidja), and Shimwali (the dialect of Mohéli, or Mwali). Shingazidja and Shimwali on the one hand and Shimaore on the other hand are generally not mutually intelligible. Shindzwani and Shimaore are perfectly mutually intelligible. At the 2007 census, 63.2% of people 14 years and older reported that they could speak French, with large differences with age. 87.1% of those whose age was 14 to 19 years old reported that they could speak it, whereas only 19.6% of those aged 65 and older reported that they could speak it. 93.8% of the population whose age was 14 or older reported that they could speak one of the local languages of Mayotte (Shimaore, Kibushi, Kiantalaotsi, or any of the Comorian dialects, which the census included in the 'local languages'). 6.2% of the population aged 14 and older reported that they spoke none of the local languages and could speak only French. With the mandatory schooling of children and the economic development both implemented by the French central state, the French language has progressed significantly on Mayotte in recent years. The survey conducted by the Ministry of National Education showed that while first and second language speakers of French represented 56.9% of the population in general, this figure was only 37.7% for the parents of CM2 pupils, but reached 97.0% for the CM2 pupils themselves (whose age is between 10 and 14 in general). Nowadays there are instances of families speaking only French to their children in the hope of helping their social advancement. With French schooling and French-language television, many young people turn to French or use many French words when speaking Shimaore and Kibushi, leading some to fear that these native languages of Mayotte could either disappear or become some sort of French-based creole. Approximately 26% of the adult population, and five times as many women as men, report entering trance states in which they believe they are possessed by certain identifiable spirits (Djinns) who maintain stable and coherent identities from one possession to the next. Caring for the Lagoon, a documentary on the preservation of Mayotte's lagoon. ^ a b c d INSEE, Government of France. "Estimation de population par région, sexe et grande classe d'âge - Années 1975 à 2019" (XLS) (in French). Retrieved 2019-04-08. ^ a b c "Gross domestic product (GDP) at current market prices by NUTS 2 regions". Eurostat. Retrieved 2019-04-08. ^ "Enseigner la langue française à Mayotte : des moyens de surmonter quelques crises et conflits possibles - Revue TDFLE". revue-tdfle.fr. Retrieved 12 December 2018. ^ a b INSEE, Government of France. "LANG1M- Population de 14 ans ou plus par sexe, âge et langues parlées" (in French). Retrieved 2013-10-10. ^ a b Zinke, J., Reijmer, J. J. G., Thomassin, B. A., Dullo, W. Chr. (2003) Postglacial flooding history of Mayotte Lagoon (Comoro Archipelago, southwest Indian Ocean). Marine Geology, 194, 181-196. ^ name="Volcano Discovery" Volcano Discovery Te most recent age reported for an ash band is 7000 year BP. ^ a b Trevor Nace (2018-12-03). "Strange Waves Rippled Across Earth And Only One Person Spotted Them". Forbes. Retrieved 2019-01-26. ^ Robber Berman (2018-11-29). "An unexplained seismic event 'rang' across the Earth in November". The Big Think Inc. Retrieved 2019-01-26. ^ "Bras de fer franco-comorien au sujet de Mayotte". www.diploweb.com. Retrieved 12 December 2018. ^ "France Cast UN Veto". Pittsburgh Post-Gazette. 7 February 1976. Retrieved 13 April 2011. The vote was 11-1 with three abstentions -- the United States, Britain and Italy. ^ Celine Nahory; Giji Gya; Misaki Watanabe. "Subjects of UN Security Council Vetoes". Global Policy Forum. Archived from the original on 17 March 2008. Retrieved 13 April 2011. ^ "Enquête sur le Futur 101e Département" (in French). 2009-03-13. ^ "Mayotte votes to become France's 101st department". Telegraph.co.uk. 29 March 2009. Retrieved 1 April 2011. ^ "Mayotte becomes 101st department". The Connexion. 31 March 2011. Retrieved 2 April 2011. ^ "Comoros". General Assembly of the United Nations. 26 September 2012. Retrieved 12 December 2018. ^ Elise Cannuel (31 March 2011). "EU shores spread to Indian Ocean island". Deutsche Welle. ^ "Mayotte accède à son statut de département dans la confusion". Le Monde. ^ Marina Mielczarek (31 March 2011). "Mayotte devient le 101ème département français". Radio France Internationale. ^ "Council Directive 2013/61/EU of December 2013" (PDF). 2013-12-17. Retrieved 2014-01-01. ^ Minister of the Economy, Industry and Employment (France). "L'évolution du régime monétaire outre-mer" (in French). Archived from the original on 19 November 2004. Retrieved 30 November 2008. ^ INSEE, Government of France. "256 500 habitants à Mayotte en 2017" (PDF) (in French). Retrieved 2018-01-01. ^ INSEE, Government of France. "Figure 3 - Répartition de la population de Mayotte en 2017, par lieu de naissance et nationalité". Retrieved 2019-04-08. ^ INSEE, Government of France. "Population de Mayotte selon le lieu de naissance - RP 07" (in French). Archived from the original on 2019-04-08. Retrieved 2013-10-04. ^ INSEE, Government of France. "Figure complémentaire 3 - Répartition de la population selon le lieu de naissance". Retrieved 2019-04-08. ^ INSEE, Government of France. "Les naissances en 2017 - État civil - Fichiers détail". Retrieved 2019-04-08. ^ "Europe | Mayotte backs French connection". BBC News. 29 March 2009. Retrieved 1 April 2011. ^ "Africa :: Mayotte". CIA. Archived from the original on 21 September 2012. Retrieved 1 April 2011. ^ Daniel Barreteau. "Premiers résultats d'une enquête sociolinguistique auprès des élèves de CM2 de Mayotte" (PDF) (in French). Archived from the original (PDF) on 14 June 2007. Retrieved 2007-05-17. ^ Malango Mayotte (2 October 2009). "Le shimaoré fout le camp" (in French). Archived from the original on 18 December 2013. Retrieved 10 October 2013. 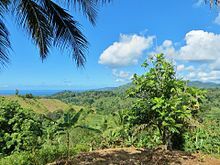 Wikivoyage has a travel guide for Mayotte. "Mayotte". The World Factbook. Central Intelligence Agency.